Finding Tango challenging? That's good news! If you are finding that learning tango is challenging, that is good news! Yes, it's good news because it means that learning tango will fire up new neural pathways, and that is excellent for the health of your brain and definitely anti-ageing! It is often said that the best way to prevent or slow down the onset of Dementia and Alzheimers is to learn something new and different to what you already know or do well. Learning to speak a new language or play a new instrument is often recommended for this purpose. "is a plastic, living organ that can actually change its own structure and function, even into old age. The brain is not, as was thought, like a machine, or “hardwired” like a computer. Neuroplasticity not only gives hope to those with mental limitations, or what was thought to be incurable brain damage, but expands our understanding of the healthy brain and the resilience of human nature." Doidge's research proves that people of average intelligence can, with brain exercises, improve their cognition and perception in order to become savant calculators, develop muscle strength, or learn to play a musical instrument, simply by imagining doing so. This however requires repetition of exercises over an extended period of time. 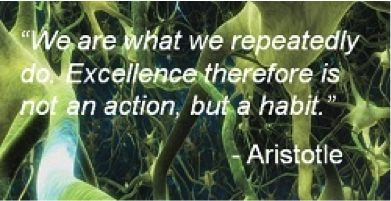 Neural changes don't happen over night but through persistence and repetition. The beauty of Tango is that it not only exercise your body, it also exercises your brain! So there is no excuse if you believe you 'have two left feet'...'just can't dance' ...'can't hear the rhythm'. This (perceived) reality can be changed by regularly attending tango lessons, at least once a week, and ideally practicing in between lessons. If you are one of those people with negative self-talk about your tango ability, all the more the reason why you should continue your tango lessons and get those new neurons firing! Tango is not always so 'serious'! ☆ Click here to find out about our upcoming tango courses in Bondi and North Sydney - from beginners to advanced levels.